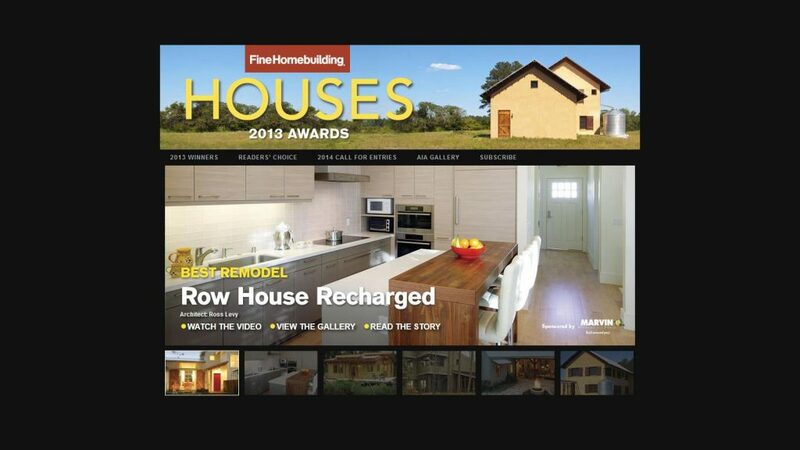 Our Zero Energy House was awarded the Best Remodel by Fine Homebuilding Magazine. A San Francisco row house was badly in need of a renovation. In addition, the owners wanted a more modern home for their growing family, and they wanted their house to meet its own energy needs plus those of an electric car. Although city preservation requirements limited the changes that could be made to the house’s Edwardian facade, architects Ross Levy and Karen Andersen found that they could give the facade a simple facelift while transforming the house behind it. Because row houses can feel cramped and dark, Levy and Andersen brought light inside and created the illusion of space with three strategies: (1) defining spaces with details, not walls; (2) integrating glazing where it would have the most impact; and (3) using a central stairway with a skylight at the top as a lightwell. They achieved net-zero energy use by insulating the roof with open-cell spray foam and the walls with an inch of closed-cell foam covered with fiberglass batts, making the house all-electric, and powering it with an 8kw photovoltaic array. A chart demonstrates the economics of this net-zero home and estimates the payback time for the energy-efficiency extras to be nine years. For its successful bonding of preservation with performance while also reflecting its owners’ lifestyle, this home is FHB’s remodel of the year for 2013.